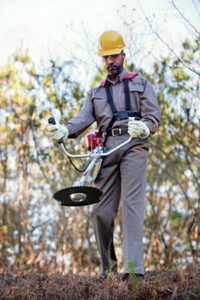 Gasoline has served as the go-to fuel option for many years when it comes to handheld equipment. However, the recent rise of battery-powered equipment — and subsequent use of propane-powered generators to recharge that equipment — has stoked the number of choices landscape contractors have at their fingertips. While gasoline-powered equipment no longer represents a monopoly, it’s important to note that it’s still the prevalent option for landscape pros, according to Doug Hartley, application engineering manager for the Honda Engine Group. He adds that gas-powered equipment typically boasts a strong power-to-weight ratio and that contractors don’t need to worry about constantly recharging the equipment. On the other hand, Poluka says those benefits also come with higher noise and emission levels. For contractors who decide to use gas to power their equipment, Hartley suggests making sure a clean air filter and air cover cleaner are installed. It’s also important to use fresh fuel. “Gasoline tends to have a shelf life of 30 to 60 days. Anything beyond that, the fuel breaks down and gums up the carburetors and fuel lines. Those can be costly repairs,” Poluka says. Within the past five years, many landscape pros have adopted battery-powered equipment and are familiar with some of its benefits: less noise, fewer emissions and lower overall cost of maintenance as there aren’t any carburetors, fuel lines or fuel filters, Poluka says. However, there’s more to consider than quieter surroundings and a smaller on-site carbon footprint, according to Jeremy Wishart, director of off-road business development for the Propane Education and Research Council. For landscape pros who may be interested in switching to battery-powered equipment, Hartley says it’s important to consider how to properly dispose of the battery at the end of its lifespan. “Because of the chemicals, finding a place to recycle lithium-ion batteries can be a little tricky,” he says. To ensure batteries are safely and properly recycled, landscape pros should follow the equipment manufacturer’s recommended procedures for battery disposal and recycling and research and adhere to local jurisdictional codes and regulations for disposal, according to Wishart. Manufacturers have not yet released any propane-powered handhelds, so how does propane fit into the equation? Wishart has an answer. The main benefit of using propane is lower fuel costs, especially when factoring in the cost of spillage, theft and evaporation, Wishart says. In addition to also producing a reduced carbon footprint, propane can be used as a one-size-fits-all option for several different fuel applications, he adds. Wishart acknowledges that converting to propane options can be overwhelming if landscape pros attempt to make the switch without help. “At the end of the day, if you reach out to the right people or partner with your local propane retailer and they set you up with refueling infrastructure, everything falls into place,” he says.